Reading Goethe as a high school student decades ago wasn’t exactly a beautiful experience. But fast-forward to the 21st century and I think he was on to something. This wine is a sense of the beautiful. Just its color shimmering through the glass on the store shelf was seductive. Rose water. Petals with their essence extracted. Pure essence. If you cook Indian dishes and use rose water, you have an understanding of this color. So I bought it, years ago, albeit reluctantly. I don’t like “celebrity” wines. Wines with photos of long dead movie stars on the label; stars that had never worked a vineyard and whose only association with wine was that they could afford to drank too much of it. There is a chasm between marketing and winemaking, though I understand the need to bridge it if the business is to continue. But when a company indifferently relies more upon the skill of its marketing than upon its winemaking, they fail to attract me. Labels with offensive double entendres, labels with photos of sports stars whose light has long diminished and never shined upon a vine anyway, singers…. oh, just spare me. Count me out. But I bought Miraval years ago and have been buying it every year since my first taste. Brad Pitt and Angelina Jolie bought the estate in 2012 for an estimated cost of $60 million. Learning that actually discouraged me from buying the wine. Would this become just another wine whose appeal was its connection to movie stars? I don’t follow their lives in fan magazines; don’t care about whom they marry or what they do off-screen. And the bottle is oddly shaped making storage difficult and the label contains no information about the wine. Was this another example of more attention being paid to marketing at the expense of making a good wine? 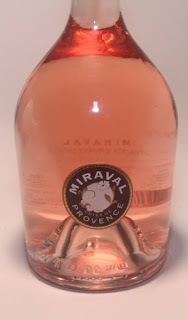 Miraval was launched on Valentine’s Day in 2013 and the first 6000 bottles were sold out in five hours. Oh, oh: the heard was being moved, it seemed, by stardom not quality. Even worse: the wine had previously been released (pre Pitt-Jolie) under the name “Pink Floyd” after the rock band that recorded “The Wall” in Miraval’s recording studio. This had the markings of stardom fancying itself for an encore. But then I learned that the Perrin family was involved. Perrin on wine is like the words “Gold Note” on older paper currency. It adds value. Wine Spectator ranked the first vintage of Miraval at 84 out of the year’s Top 100 wines of 2013. It was the only rose wine included. Decanter described its elegance and its mouthwatering finish. Turns out grapes for Miraval are selected from the best parcels: Muriers, Longue, Romarin and selected also from the best terroirs of Provence with clay and limestone soil and from elevation of about 1,247 feet: cool temperature vineyards with large diurnal swings. Turns out too that grapes are harvested in the early morning to preserve the fruit’s fresh character, and they’re sorted twice. bottle (also oddly shaped) but 1.5 liters. latter being partially vinified using the “saignee” method. Similar to “drawing off,” “saignee” involves removing only a portion of the juice from its skin contact, the remainder being retained for use in red wine production. Rose made in this method will have higher acid, though it’s important to remember that in Miraval, only the Syrah is vinified this way and only a portion of it is so used. Rolle may be better known as Vermentino, a light skinned wine grape made famous from Italy. As in so many things of beauty, the composition is greater than its individual parts. Call it teamwork. In the case of Miraval, call it experienced expert winemaking. Only 5% of the juice sees wood (with batonnage). The rest is vinified in temperature controlled stainless, or what I personally think qualifies as the greatest advance in winemaking since yeast was first discovered. The result is a wine that speaks freshness with delicate aromas of white flowers. Mineral notes with a sense of salinity. Lovely balance and seamless integration of raspberry, wild strawberry (I grew them, but then were they no longer wild? ), cherry, pear, white tea and rose water. As with all wines of quality, for me, it’s not the individual taste notes (which can be discerned), bit how those notes play together. In Miraval, it’s a symphony of finesse. Marc Perrin has said that Angelina and Brad have been intimately involved in the wine making process, attending “rose blending sessions” and helping to design a new shape and label for the bottle (the latter being something obviously successful but of which I’m not a fan). But as for the wine, I am a fan though I must disclose that when it comes to Rose wine, I have a preference for those of Provence. What spring-boarded California to world attention resulted from its ability to innovate and an appellation system not based on varietals but only zone. As a lover of “old world” wine I have an appreciation of “old world” requirements: varietals must include certain percentages of particular grapes to be labeled with the appellation. Yields must be restricted to meet established standards and there are other requirements. So called IGT wines are not inferior to DOGC labeled wines; they just don’t meet the standard for DOGC or DOC labeling. Wines labeled simply as “Vin de France” (that term replaces the older “Vin de Table) allows for wines that are multi-regional and multi-varietal. Whether such a wine from Miraval will be “good” will ultimately depend upon the site decisions, the winemaker and consumers. Personally, I look forward to Miraval’s introduction. Wine Mizer is not a “dba” because it does not do any business. Truth be told, it is a not-for-profit non-corporation, money-losing sole-proprietorship venture. Such assures you, however, that opinions are unbiased. Wine Mizer accepts no advertisements. Support this venture by “Liking” Wine Mizer on facebook. Like Wine Mizer on facebook. You’ll also enjoy industry news, mini wine reviews, recipes, food and wine pairings, fun facts and more!